The Seahawk is a twin-engine helicopter. It is used for anti-submarine warfare, search and rescue, drug interdiction, anti-ship warfare, cargo lift, and special operations. The Navy's SH-60B Seahawk is an airborne platform based aboard cruisers, destroyers, and frigates and deploys sonobouys (sonic detectors) and torpedoes in an anti-submarine role. They also extend the range of the ship's radar capabilities. The U.S. Navy plans to convert all SH-60Bs, as well as 18 SH-60Fs, to multi-mission SH-60Rs. The new version will feature advanced radar, missiles, low frequency sonar and a host of other improvements. The UH-60 Black Hawk was fielded by the Army in 1979. 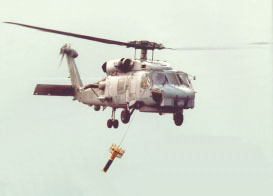 The Navy received the SH-60B Seahawk in 1983 and the SH-60F in 1988. The Air Force received the MH-60G Pave Hawk in 1982 while the Coast Guard received the HH-60J Jayhawk in 1992. Some versions, such as the Air Force's MH-60 G Pave Hawk and the Coast Guard's HH-60J Jayhawk, are equipped with a rescue hoist with a 250 foot (75 meter) cable that has a 600 pound (270 kg) lift capability, and a retractable in-flight refueling probe. The Army's UH-60L Black Hawk can carry 11 soldiers or 2,600 pounds (1,170 kg) of cargo or sling load 9,000 pounds (4,050 kg) of cargo.